The disciplines of change management and project management cross paths throughout the execution of an initiative. Each brings necessary and critical structure for effectively implementing change and realizing results. Getting the project team on board and engaged in change management can make or break an initiative. This article shares the top five obstacles practitioners face regarding integration—along with the key success factors for overcoming them—to help you be more successful in bringing together these disciplines. Even when change management and project management are both applied on a change, they may not necessarily be integrated. 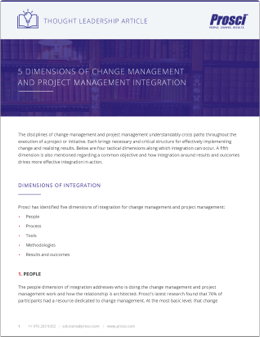 Before we start talking about the keys to successful integration, use the two questions below to check that the essentials are in place for change management and project management integration to occur. Are Both Teams Focused on Results and Outcomes? The project team must be focused on, responsible for and held accountable for delivering results and outcomes for meaningful integration to occur. If the project team is only held accountable for “flipping the switch” or hitting a go-live date, then integration will be more difficult. Likewise, change management resources must define their own success in terms of the achievement of project results and outcomes, not simply executing change management activities (such as number of communications delivered or number of employees trained). This shared focus on results and outcomes is the cornerstone of successfully integrating the technical side and the people side of change. The most pressing issue regarding integrating project management and change management is gaining buy-in, awareness and support from the project team around the importance of change management. Project leaders and project managers may not see the value or importance of change management. Additionally, project teams could perceive change management as overhead that slows down the project and eats into the budget. Project teams may lack an overall awareness of the importance and value change management provided to the change effort. Change management must be valued and viewed as a crucial component of project delivery. As a change management practitioner, this means making a case for change management that directly connects to the success of the project or initiative. While there are a number of approaches for making this connection, applying change management must be shown to have a direct impact on realizing benefits and achieving the desired results and outcomes. Make change management meaningful and real. Connect with what the project team cares about, which means focusing on the ability of the project to deliver the intended results and outcomes through better adoption and usage of the solution by employees. Additionally, since many project leaders are concerned with delivery being on time and on budget, an effective pitch for change management shows that by successfully managing the people side of change, projects are actually more likely to be on schedule and on budget. To make change management more real to project teams, present change management in their terms as a credible, structured and intentional approach, guided by processes with concrete milestones and deliverables. The more rigorous and structured you make change management feel, the more support you gain from project teams. In many organizations, the practice of project management is well established and senior leaders believe it is necessary to achieve business results. In fact, no project in these organizations would be launched without applying project management. It is not always the same case for change management, even though managing the people side of change is imperative to achieving the desired business results of a project. Leaders and sponsors may have a limited awareness of the need for change management, which impedes the critical integration of change management with project management activities. The leadership team needs to treat change management as equal in order to ensure the integration is not only adopted, but effectively producing results. 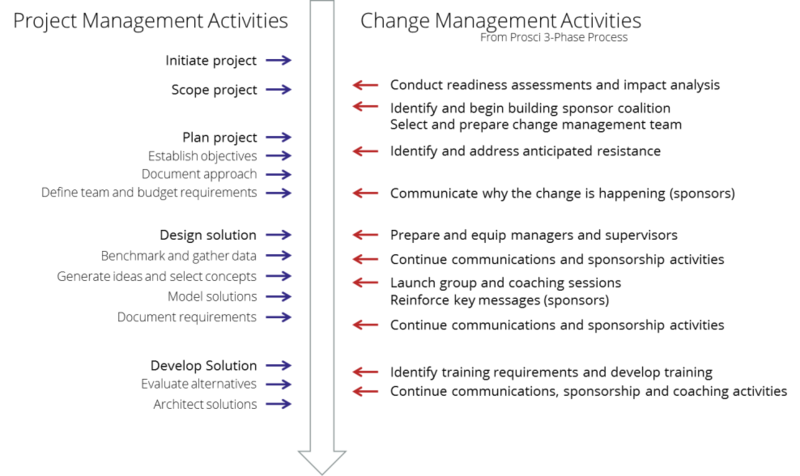 In addition to impeding integration of project management and change management, a lack of awareness of the importance of change management in the eyes of leadership impacts resource allocation and budgeting; scarce resources are often applied to project management in lieu of change management. Leadership support for and commitment to change management is critical for effective integration. Connect change management to achieving the intended benefits and value from change. The case for change management should be directly tied to the ultimate results and outcomes of the project. By making a direct connection between how well the people side of change is managed and the ultimate ROI of the project, you can shift the context and the conversation. The third most pressing issue involves scoping the project to determine how much change management is required on a project, prioritizing which projects require the most change management and making sure change management is involved early on and consistently throughout the project. Change management is often brought in after project initiation, which does not allow enough time to properly apply change management. Be structured in your change management approach and ensure that planning and strategy development take place in collaboration with the project team. By asking important change-management-oriented questions early on you can position change management and help provide clarity on the scope of the change management challenge at hand. Having open communication between project management and change management to enhance integration is also recognized as an important need. Provide specific, concrete opportunities for integration. This begins by gaining foundational knowledge and insights into your organization’s project management processes. Encourage project managers to do the same for change management. Understand the function of not only the change practitioner’s tools, but also the project manager’s tools. Then, you can identify connections, overlaps and similarities between the project management process and the change management methodology and uncover opportunities to integrate. There is a common struggle when it comes to defining, clarifying, and enforcing the roles of change management and project management. This includes delineating the role of the change leader from the project leader. In addition to role confusion, there can be instances of an inaccurate or incomplete definition of change management. In some cases, change management is only viewed as communications or training. Project teams may perceive change management’s role as damage control. Clarity around who should follow up with stakeholders and who should take accountability for project outcomes can also an obstacle. Be preemptive about defining and clarifying roles. Identify activities that might result in overlap when it comes to which role carries out which task and discuss these activities up front with the project team. Also, keep in mind what appeals to project teams while you work to define the roles. To avoid a misunderstanding that the role of the change practitioner is to carry out overhead activities, busy work or damage control, give examples of how the tasks done by the change practitioner are equally concrete and purposeful as those done by the project team. Success for a project or initiative results from an effectively designed, developed and delivered solution that is embraced, adopted and utilized by impacted employees. As you begin or continue the push to integrate change management and project management in your organization, you might come across one or more of these pressing issues. These obstacles and their solutions show just how important it is to recognize and communicate that change management is intrinsically and inextricably tied to the realization of organizational results and outcomes. When integrated in the delivery of a project or initiative, project management and change management together provide a unified approach for achieving the desired results and outcomes of organizational change. The disciplines of change management and project management understandably cross paths throughout the execution of a project or initiative. Each brings necessary and critical structure for effectively implementing change and realizing results.